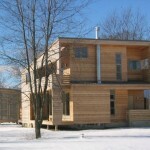 Garrison Architects designed the Koby Cottage in Albion, Michigan. This guest house was created for families to use while visiting their children at Starr Commonwealth, a nonprofit organization in Michigan. The organization’s services range from foster care to residential treatment and in-home counseling programs that help young adults learn to live independently. 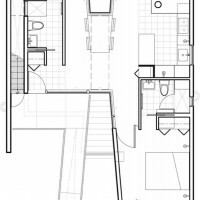 The house plan is composed of two diagonal intersecting axes centered around the dining room table as a meeting place for the family. 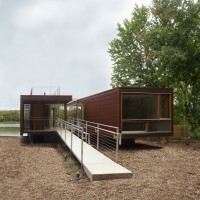 One axis includes the bedrooms of all family members. 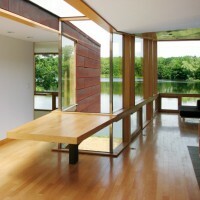 The other axis, which incorporates the public entry hall and living room, runs through the building in a diagonal pathway which culminates in the expanded volume of the living room and expansive views of the lake beyond. 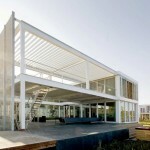 The design, two volumes connected by a glass enclosure, employs tectonic expression of the modules. 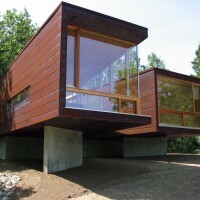 Yet the rectilinear module forms are opened up to the outdoors through variations in glass and wall surfaces. A light wood interior is housed within a cor-ten exterior that blends into the colors of the surrounding natural environment. 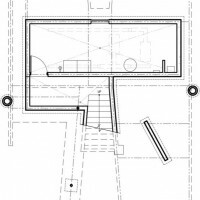 The building is a device that creates new ways of viewing landscape as a vertical slice of nature brought deeply into the volume of the house. 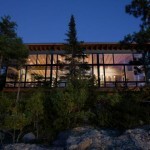 Use of glass corners throughout the building, especially in the dining room intersection, creates a blurring between the space inside the house and the space of nature in which it is suspended. An open rooftop deck creates a direct connection with the outdoors, establishing a sense of openness. 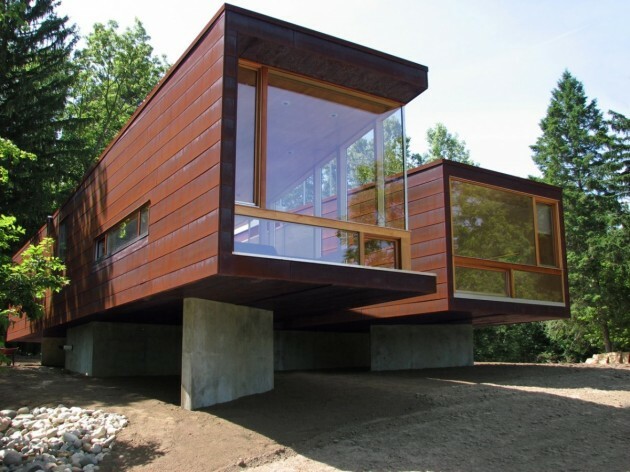 The fact that the building is cantilevered off the hillside prevents outside viewers from seeing into the house from below, providing complete privacy for the residents. 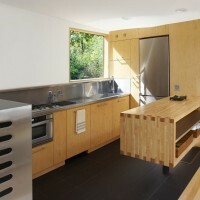 Visit the Garrison Architects website – here.